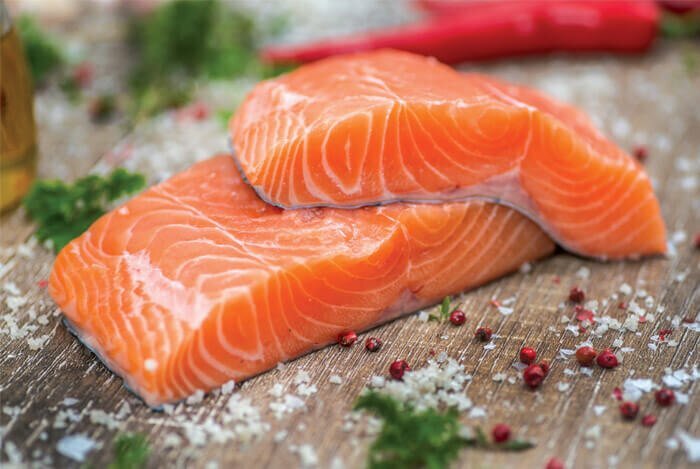 When it comes to dieting, one of the best means of getting a healthy amount of these fats while also loading up on proteins is by eating fish. Lots and lots of delicious fish. I figured the best way to help you incorporate more wonderful, fatty fish into your diet was to provide you with some excellent recipes from around the web. 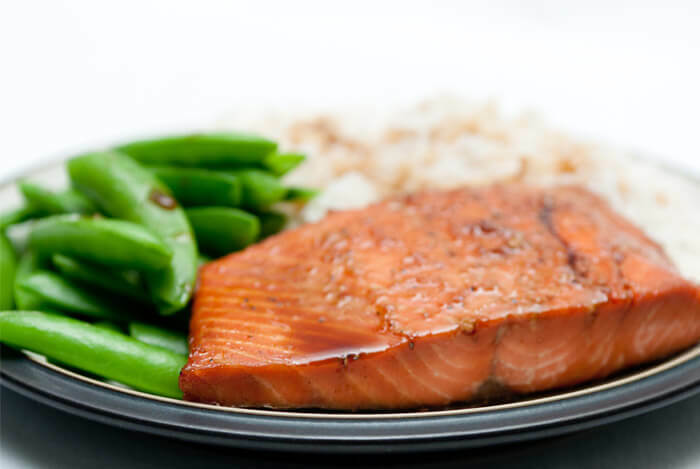 Salmon is guaranteed to make more than one appearance on this list, thanks to its fantastic supply of nutrients. This flavorful (and potentially very spicy, depending on how you handle your red peppers) fish dish will provide you with 13 grams of fat, an incredible 32 grams of protein, and 871 milligrams of potassium. When you’re taking your first break from the wonders of salmon, halibut will do just fine as an alternative. This recipe makes it clear that any fish will do for this dish however. Preheat oven to 425 degrees F. Coat a 9-by-13-inch baking dish with cooking spray. To make breadcrumbs, grate bread through the large holes of a box grater; place the crumbs in a small bowl and toss with 2 teaspoons oil. Heat the remaining 2 teaspoons oil in a medium nonstick skillet over medium heat. Add shallot and cook, stirring, until softened, 2 to 3 minutes. Pour in lemon juice and bring to a boil, stirring gently; remove from the heat and add butter. Swirl the pan, letting the butter melt and slightly thicken the sauce. Stir in capers. Sprinkle fish with salt and place in the prepared baking dish. Pour the pan sauce over the fish and sprinkle with the breadcrumbs. Bake the fish until it is opaque in the center, 15 to 18 minutes. Serve each portion topped with about 3 tablespoons pickled beets. For some lighter fare, this seafood salad is exactly what I look for when I go to restaurants that are heavy in the pasta-seafood platters. Though, I’m rarely fortunate to find one that combines shrimp and scallops with wondrous avocado. You’re looking at a cool 12 grams of fat, 8 grams of fiber, and 32 grams of protein. Combine the quartered celery, smashed garlic, half of the lemon juice, 10 cups water, and salt and pepper to taste in a large saucepan. Cover and bring to a boil, then uncover, add the carrots and cook 2 minutes. Add the shrimp and cook until opaque, about 4 minutes. With a slotted spoon, transfer the carrots and shrimp to a colander and rinse under cold water. Return the water to a boil, add the scallops and cook until opaque, 1 to 2 minutes. Remove the scallops with a slotted spoon, add to the colander and rinse under cold water. Ladle out 1/3 cup of the poaching liquid; set aside to cool. Dice half of the avocado and combine with the sliced celery, lettuce, capers and croutons in a large bowl. Add the carrots, shrimp and scallops. Puree the remaining avocado half in a blender with the reserved poaching liquid, the remaining lemon juice, the caper brine, chopped garlic, mayonnaise, 1/2 teaspoon salt, and pepper to taste. Toss with the salad and season with salt and pepper. My first ever tuna steak was a revelation. Since then, I’d say I’ve eaten quite a few more, and never felt guilty after a meal. And let me tell you, pistachios should be coupled with fish more often. Per serving this recipe has 7 grams of total fat, 29 grams of protein, and only 241 calories. Because of how flexible this recipe is on the type of fish you use, I’ll go ahead and recommend salmon. You may be able to tell, I love salmon. However, the recipe says cod, red snapper, trout, or halibut would also be perfectly suitable. Each serving will net you 29.7 grams of protein, anywhere from 1.1 gram to 13 grams of fat (depending on your fish), and only 142 calories. Cut 6 foil squares large enough for each fillet. Center fillets on the foil squares and sprinkle each with dill weed, onion powder, parsley, paprika, seasoned salt, lemon pepper, and garlic powder. Sprinkle lemon juice over each fillet. Fold foil over fillets to make a pocket and fold the edges to seal. Place sealed packets on a baking sheet. What better way to bring out the awesome flavor of salmon than to combine it with the strong, unique flavors of bourbon? This is one of the lower sodium content recipes I’ve found so far, coming in at only 281 milligrams, along with 14.1 grams of fat and a powerful 37.4 grams of protein. Add fish and marinade to pan; cook fish 4 minutes on each side or until fish flakes easily when tested with a fork or until desired degree of doneness. Place 1 fillet on each of 4 plates; drizzle each serving with about 2 teaspoons sauce. Sprinkle each serving with 1 tablespoon green onions and 3/4 teaspoon sesame seeds. 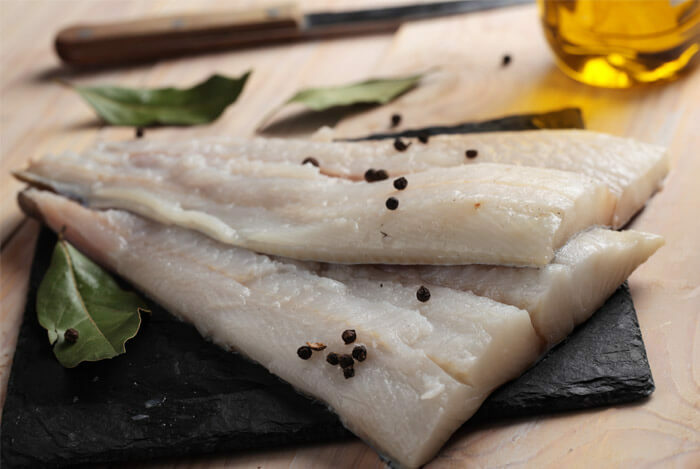 From the seas also comes mackerel, another rather fatty, heart healthy fish that promises its own taste and texture, as well as a bounty of omega-3s and other nutrients. There’s 23 grams of fat per serving in this dish, combined with 30 grams of protein and 730 milligrams of potassium. Prepare the onion first: put it in a bowl, sprinkle over a good pinch each of salt and sugar and a grinding of pepper and toss. Leave for 10 minutes to soften (if the onion releases a lot of liquid, drain it off). Sprinkle over the vinegar and dill or parsley, stir, and leave for 10 minutes more. Taste, add more sugar, salt or pepper as needed, and set aside until you are ready to serve – it will also keep in the fridge for up to 24 hours, but make sure you let it return to room temperature before serving. Drain the oil from the cans of mackerel, and tip the fish into the bowl of a food processor. Add the mustard, creme fraiche, cayenne, some black pepper and a good squeeze of lemon. Blitz to a thick paste, stopping several times along the way to scrape down the sides of the processor. Taste and add salt, if necessary (the canned fish is already quite salty), and more pepper or lemon juice, if you like. 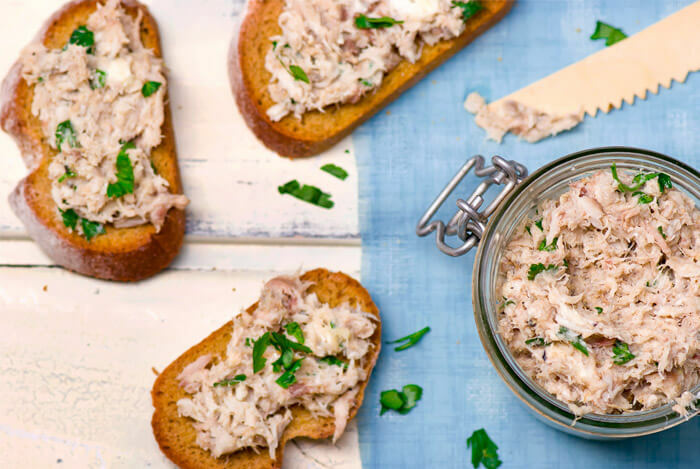 Serve the pâté spread thickly on toast or oatcakes, with a scattering of the piquant onion on top. 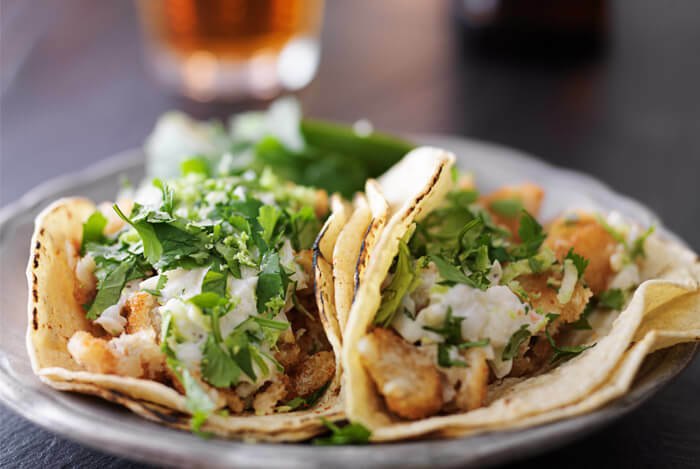 There’s something about tacos that keeps me coming back to them time and time again, trying to find other variations on them that will surely be delicious and nutritious. 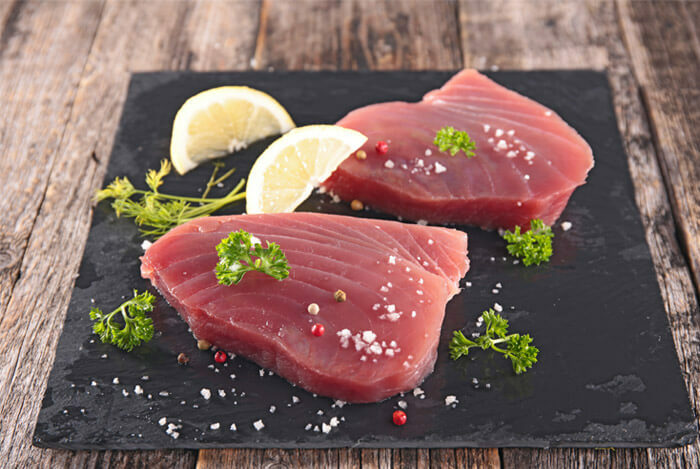 Depending on whether you use mahi mahi or another variety of fish, your fat content may change. As the recipe stands, you’re looking at 6 grams of fat, 20 grams of protein, only 235 calories, and a bonus 75 milligrams of calcium per serving. Sprinkle both sides of fish with fajita seasoning, gently pressing into flesh. Grill fish 3-4 minutes on each side or until fish flakes easily when tested with a fork. Flake into pieces with a fork; keep warm. Wrap the tortillas in paper towels, and microwave 1 minute on HIGH or until they’re warm. This one really knocks it out of the park when it comes to nutritional value, and fancy recipe names. 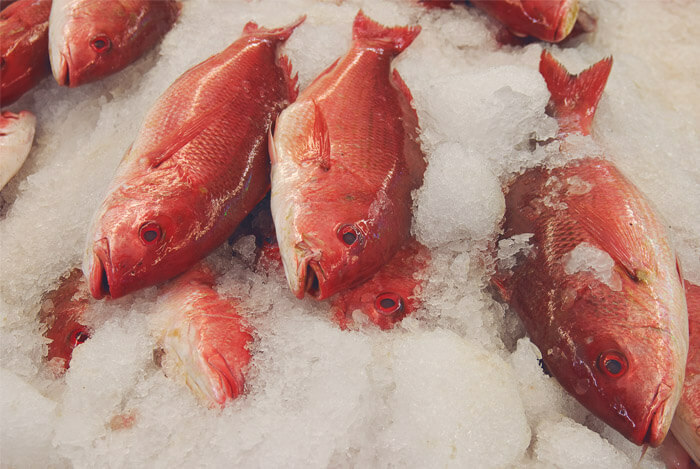 This fish will supply you with 15 grams of fat, 35 grams of protein, 621 milligrams of potassium, and 9 grams of fiber. Meanwhile, rub salmon with the remaining 1/4 teaspoon each salt and pepper. If grilling, oil the grill rack. If broiling, coat a broiler pan with cooking spray. Grill or broil the salmon until browned and just cooked through, about 3 minutes per side. 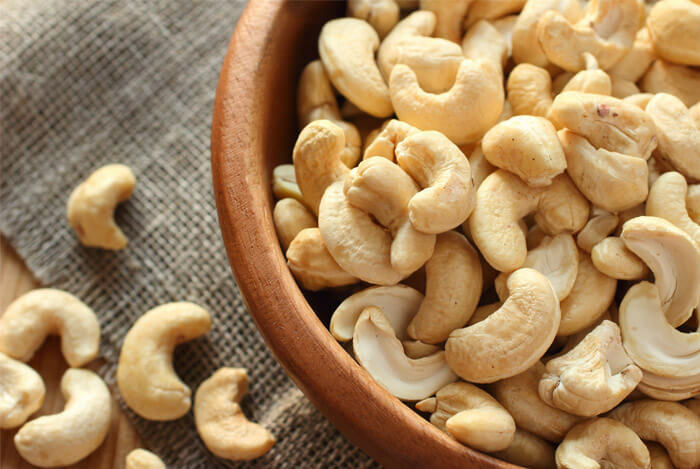 Serve with the couscous, topped with the yogurt sauce and cashews. If you try any of these recipes, you can be sure you’ll be getting all the amazing health benefits fats have to offer. 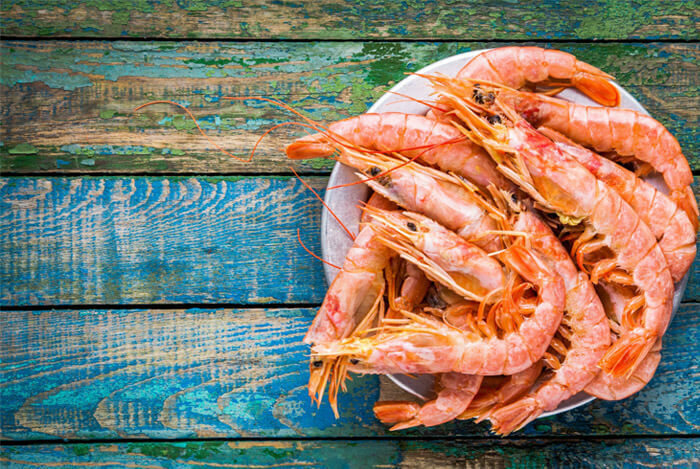 What’s your take on these healthy fish recipes? Have anything else you’d like to share? Let me know in the comments below!